In November, the world took a moment of silence on the World Day of Remembrance for Road Traffic Victims to commemorate all those who have been affected. Such a day is a powerful reminder of the importance of interventions that improve road safety. AIP Foundation stands in solidarity with all those impacted by road traffic crashes and will stay committed to working to prevent road crash injuries and fatalities in low- and middle- income countries. The #SaveKidsLives campaign also launched as a global call-to-action, asking supporters to read and sign the Child Declaration for Road Safety. Through the campaign, you can take part in the current Decade of Action for Road Safety and help save lives. Please see below to read more on this campaign, as well as AIP Foundation’s activities and achievements throughout the month. “On this World Day of Remembrance for Road Traffic Victims, let us re-commit to making roads that are safe for all,” he said. Read Ban Ki-moon’s full message here. Mr. Greig Craft, President and Founder of AIP Foundation, with Mr. Saul Billingsley, Director General of FIA Foundation, Allison Zelkowitz, Country Director of Save the Children Thailand, helmet-wearing K-pop group Crayon Pop, Mrs. Ratanawadee H. Winther, Country Director of AIP Foundation Thailand, and Mirjam Sidik, AIP Foundation CEO. The campaign calling to save children’s lives on the roads around the world has officially launched. #SaveKidsLives is the worldwide and official campaign for the Third United Nations Global Road Safety Week, to be held May 4-10, 2015. The campaign is managed by members from the United Nations Road Safety Collaboration. You can take part in saving kids’ lives on the roads. Read and sign the Child Declaration for Road Safety; download the signboard; write your road safety message; take a photo and share it. For more information, visit the Save Kids Lives website. Ms. Xiaoyan Xu, Country Director of AIP Foundation in China attended the 1st International Road Federation (IRF) Asia Regional Congress & Exhibition, a regional summit for road and transportation stakeholders held in Bali, Indonesia. The IRF is a non-governmental, not-for-profit organization with the mission to encourage and promote the development and maintenance of better, safer, and more sustainable roads worldwide. More than 700 industry professionals representing 52 countries attended the summit, along with Ms. Xu, who presented on "Changing our Road Safety Culture” and "Walk Wise China: A Program in Chevron's Industry zone,” both illustrating AIP Foundation's work. 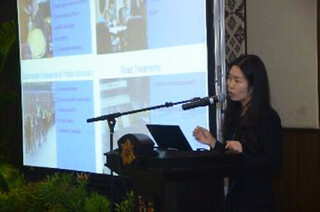 View Ms. Xu’s presentations in "Safer Roads by Design" and "Partner Sessions" here. In late October, 4,307 students and teachers from eight schools within Ho Chi Minh City received quality helmets at a Helmets for Kids kick-off ceremony at Nguyen Trong Tuyen Primary School in Binh Thanh District. 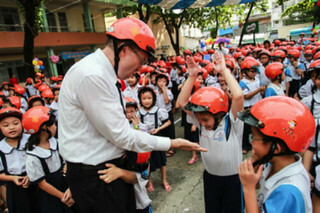 At the ceremony, The UPS Foundation and UPS Vietnam representatives assisted as “Helmet Superheroes,” handing out helmets and educating students on helmet safety. These Superheroes act as role models for the students to look up to, inspiring them to wear their new helmets every day. AIP Foundation, in partnership with the National Traffic Safety Committee, Ministry of Education and Training, and provincial counterparts, is responding to the need for road safety education and helmet use in areas where students are exposed to serious traffic risks on their way to school. More than 800 attendees, including students and teachers of the project schools, government representatives, and Goodwill Ambassador Actor Dai Nghia, were present at the ceremony. A memorial service was held in Ho Chi Minh City-based Vinh Nghiem Pagoda for the victims of road crashes in Vietnam, where 25 people die every day. The event was co-organized by the National Traffic Safety Committee (NTSC) and the Vietnam Buddhist Sangha (VBS) as part of activities to mark the World Day of Remembrance for Road Traffic Victims, which falls on the third Sunday of November each year. 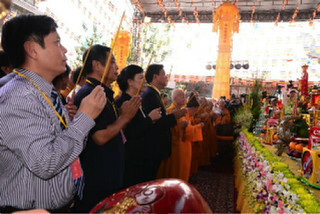 Thousands of Buddhist monks, nuns, and relatives of victims took part in the event. Minister of Transport Dinh La Thang called upon agencies at all levels, organizations, and members of the public to raise awareness on the regulations on traffic safety and order, and share the grief suffered by the victims’ families. Dozens of Vietnamese artists and celebrities are taking part in a UNESCO project to raise people’s awareness of road safety, together with environmental protection and the nurturing of good manners in public places. The celebrities, led by veteran artist Thanh Loc, are drawing attention to a project named Commit Vietnam, initiated by the UNESCO Center for Culture and Education (UNESCO – CEP Vietnam) on October 25. Loc is urging everyone, particularly the young, to participate. While the project aims foster public awareness of traffic safety and culture, environmental protection, and public manners for a better image of Vietnam, it will focus on promoting road safety and culture in Ho Chi Minh City in its first year of implementation. Visit Commit Vietnam’s webpage here. More than 70% of traffic accidents in Vietnam involve motorbikes, according to the Executive Vice-Chairman of the National Traffic Safety Committee, Dr. Khuat Viet Hung. Motorbikes are the most popular means of transport for Vietnamese because they are cheap, flexible and mobile. At present, they account for more than 85% of the total number of vehicles operating nationwide. In November, AIP Foundation attended a workshop co-organized by the National Traffic Safety Committee (NTSC), the World Bank, Australian AID, and the Association of Motorbike Manufacturers in Vietnam to assess motorcycle ownership and use in Hanoi. The workshop found: 1) motorcycle ownership and use in Hanoi is well entrenched, more so than expected; 2) users are concerned about safety and other traffic and environmental conditions; and 3) disruptive and sustained change is needed to get motorcycle users to modify their behavior. Discussion topics included helmet quality control, police enforcement, road user awareness, and emission control, among others. Attendees discussed that due to affordability, the motorcycle has contributed to the individual’s sense of ownership and has dramatically increased mobility. The workshop highlighted that motorcycles, highly flexible and efficient in terms of road space, need to be embraced, and that the work to reduce the costs and increase the benefits that come with the motorcycle and urban mobility should become a greater focus. Football star David Beckham was in Vietnam in November to promote an alcoholic drink, but it was his Facebook photo which he posted three days after his visit that grabbed global attention. The photo shows a woman on a scooter snapping a photo of Beckham; she was not wearing a helmet and worse, there was a child sleeping between her legs. The photo got more than 686,000 likes, 7,000 shares, and 18,000 comments. It also sparked discussion in Vietnam about road safety and the enforcement of traffic laws. About 14,000 people die each year in Vietnam due to traffic accidents. The police said they will file charges against the woman for violating traffic laws in order to serve as an example for other motorists. But Scott Duke Harris, an expat in Vietnam, noted that the photo was an accurate depiction of how many Vietnamese drivers and motorists are behaving in the streets. RMIT University researchers have explored motorcyclists' psyche in an effort to determine how road safety campaigns can be made more effective given Vietnam's large number of road casualties. The research builds upon exploratory studies co-authored by AIP Foundation. 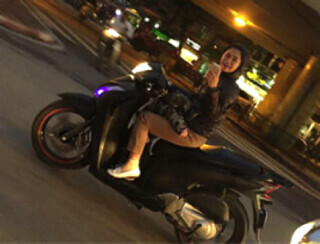 Surveying more than 500 young motorcyclists and conducting focus groups with adolescents, families, and adults to determine perceptions on riding and "social norms,” researchers found that Ho Chi Minh City motorcyclists believe they are perceived as foolish if they follow road laws around those who do not. The study also pointed out that young Vietnamese motorcyclists over-estimate their driving abilities, believing that their peers are less skilled, and speed more often. For more information, please read RMIT Vietnam news page or check out the study here. The Nghi Son Refinery & Petrochemical, LLC (NSRP) Traffic Safety Project aims to reduce the number of traffic crashes and prevent traffic-related deaths and injuries in three communes within the Tinh Gia District, Thanh Hoa Province. 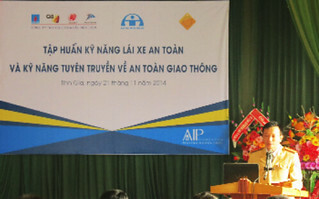 This month, AIP Foundation collaborated with Thanh Hoa Traffic Police, Tinh Gia Traffic Safety Committee, Nghi Son Police, and NSRP to organize a half-day capacity building workshop on traffic safety and traffic laws for the Women’s Association, Youth Union, Fatherland Front, and leaders of Hai Thuong, Tan Truong, and Mai Lam communes. The workshop provided attendees with key information on traffic safety, the development of traffic safety communication skills, and introduced the Traffic Safety Scale-Up Project. This government capacity building and increased support from the workshop will help to increase the sustainability of the project and provide local government with the tools and knowledge to continue long-term behavior-change efforts. 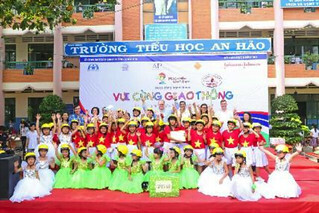 To commence AIP Foundation’s Helmets for Families program in Tra Vinh Province, nearly 8,200 high-quality helmets were donated to students and discounted to parents from nine schools in Tra Vinh and Ho Chi Minh City during a kick-off ceremony at Phuong 8C Primary School. 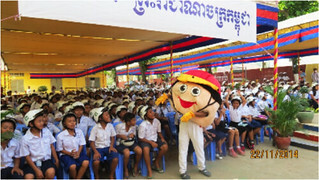 Students were educated on proper helmet-wearing and road safety and teachers were provided with road safety teaching tools. Additionally, parents were advised on the importance of helmets, taught how to choose high-quality ones, and were given the opportunity to exchange their substandard helmets for high-quality subsidized ones. 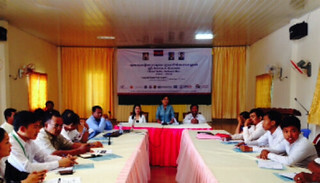 In October, Vice Director of the Department of Education and Training met with the project schools’ teachers, school administrators, principals, provincial Traffic Safety Committee, and traffic police at an orientation workshop to gather support for improving standard helmet use among students and parents. Following the workshop, AIP Foundation trained 128 of the schools’ teachers on helmet use, in order to educate students accordingly and increase the program’s sustainability. Click here to read more about the event and access photos. 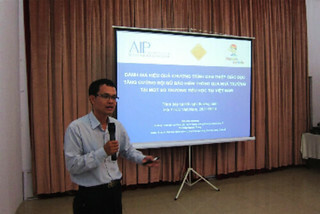 AIP Foundation's Regional Monitoring & Evaluation Manager Dr. Truong Bui presented at the 10th Annual National Conference of Vietnam Public Health Association (VPHA) in Hanoi, attended by approximately 130 participants, including public health professionals, university lecturers, and researchers. Dr. Bui presented on the assessment of the effectiveness of AIP Foundation’s Helmets for Kids program in increasing helmet use among primary school students, as well as the effectiveness of integrated campaigns to address child helmet use in Vietnam. Key findings were that average helmet wearing rates across 38 Helmets for Kids schools increased from 23.6% pre-intervention to 94.9% after two weeks post-intervention, 78.7% after 10-12 weeks, and 95.7% at the end of school year (or calendar year for some schools). For more information, please visit VPHA’s website here or check out the presentation in Vietnamese. 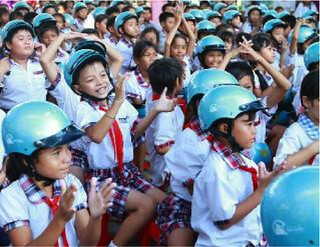 Following the donation of more than 5,000 helmets for 39 schools at the beginning of this school year, students, teachers, and parents are now showcasing their road safety knowledge with provincial “Making Traffic Safety Fun” talent shows in Ha Tinh, Quang Binh, and Dong Nai provinces. Organized through AIP Foundation’s Helmets for Kids program and supported by Johnson & Johnson, this is the first-ever province-wide gathering under the program allowing for schools to participate in road safety activities together. Mr. Gabriel Kardos, Johnson & Johnson Senior Fleet Safety Manager of Europe, Middle East, and Africa/Asia Pacific, and Mr. Abhishek Mathur, Human Resources Director of One Johnson & Johnson Vietnam, attended Dong Nai Province’s talent show on November 28, where Johnson & Johnson staff and community members facilitated and supported event activities. More than 1,000 students and teachers showcased their road safety knowledge through the art of singing, dancing, fashion shows, and dramas, with officials from the province’s Traffic Safety Committee, Department of Education and Training, and local police present as talent show judges. Click here to read more about the event and view photos. TakePart, an online social action platform, has featured Mr. Greig Craft in the article “One Man’s Mission: Helmets Across Hanoi,” as part of their TakePart World series. 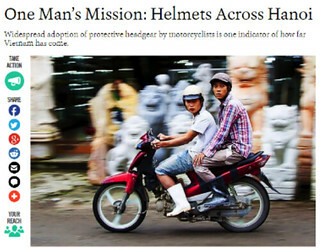 The piece highlights Mr. Craft’s mission to develop climate-appropriate helmets in Hanoi with AIP Foundation and Protec Helmet Factory, his goal to spread helmet use across Vietnam, and discusses AIP Foundation’s focus moving forward. At least 46 people died and 197 were injured in 98 accidents across Cambodia during last week’s Water Festival holiday, when thousands of people flocked to Phnom Penh to celebrate the first hosting of the event since a stampede killed more than 300 people in 2010. Besides killing and injuring almost 300 people, the 98 accidents destroyed 165 vehicles. Of the 197 people injured, 93 sustained serious injuries, statistics posted on the National Police website show. According to the website, Phnom Penh had the highest rate of accidents from November 4-8 this year. Tekao, Kampot and Kampong Speu followed. The meetings intend to provide an opportunity for commune representatives to be introduced to and updated on the project and to develop local road safety action plans targeting passenger helmet behavior-change. The meetings also aim to establish a commune-based Road Safety Working Group in all 18 target communes, which will coordinate and implement vital road safety and helmet use activities. This month, Manulife Cambodia and AIP Foundation celebrated three years of the Helmets for Families program in Cambodia by distributing 832 helmets to students, teachers, and parents in a special ceremony held at the Anuk Wat Primary School in Phnom Penh. Helmets for Families aims to increase helmet use in Phnom Penh by encouraging road safety and helmet use in local communities through education, helmet donations, and community outreach efforts. Around 1,000 students, teachers, parents, government representatives, and road safety stakeholders attended the event. His Excellency Dr. Hang Chuon Naron, Minister of Education, Youth and Sport and Her Excellency Mrs. Min Meanvy, Secretary of State of Public Works and Transportation, Deputy Chairwoman of the National Road Safety Committee were also present.